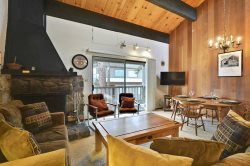 This three-story Town-home is just minutes to Northstar at Tahoe for winter snow play and sandy beaches for summer fun! At the entry level there is the bedroom with queen sized bed and balcony, a wonderful spot to greet the day, full bath with tub/shower and laundry area. The second level offers an open living-room with TV, DVD, wood burning fireplace (wood not provided) and covered deck, dining area and fully equipped kitchen. The loft has 2 single beds and half bath. Note ~ We do not consider Service Animals "pets"
Nice one bedroom with 2 beds in the loft. Good location near Northstar. Once in complex its hard to find at night as no lighted signs. Convenient lockbox with key. Roads in and out of complex including parking area are quickly plowed after snowfall. Everything was clean and the home provided all we needed. Enjoyed our stay! nice place to stay, excellent location in the north tahoe. The townhouse have three levels, with almost everything you need in your house. We are so happy with the kitchen amenities they provided, very convenient. Also the house is well decorated, so add up the experience for our stay. We will definitely come back in winter.